So today CodeClub volunteers and enthusiasts from around the Greater Manchester area got together at the fabulous MadLab in Manchester’s Northern Quarter. Some of us already knew each other either in Real Life (they’d visited our CodeClub in Mellor) or through Twitter or the NW community forum on the CodeClub website. It was all very informal. Anne (my fellow Mellor volunteer) and I talked about our experience setting up CodeClub and answered questions about how to go about it and how the projects work. The CodeClub website is a bit sparse on these details and this can make it all seem quite daunting. In my experience, it was really useful to reach out to other CodeClub volunteers around the country to pick their brains. But ultimately, every school is different so you do just have to take a leap of faith and accept there’ll be a few niggles along the way. But I think it’s good that we now have this little supportive community to help each other out and share experience. It was really interesting to hear how other people had got involved and why we were so committed to giving up our time to this project! We definitely want to meet again! We only scraped the surface today by the time we’d introduced ourselves. We want to talk about how we can spread the word to other schools or encourage more developers to get involved. But CodeClub is only the starting point. The group of volunteers in MadLab today had so many good contacts/ideas/projects they were already working on which all tie in with the CodeClub ideals. 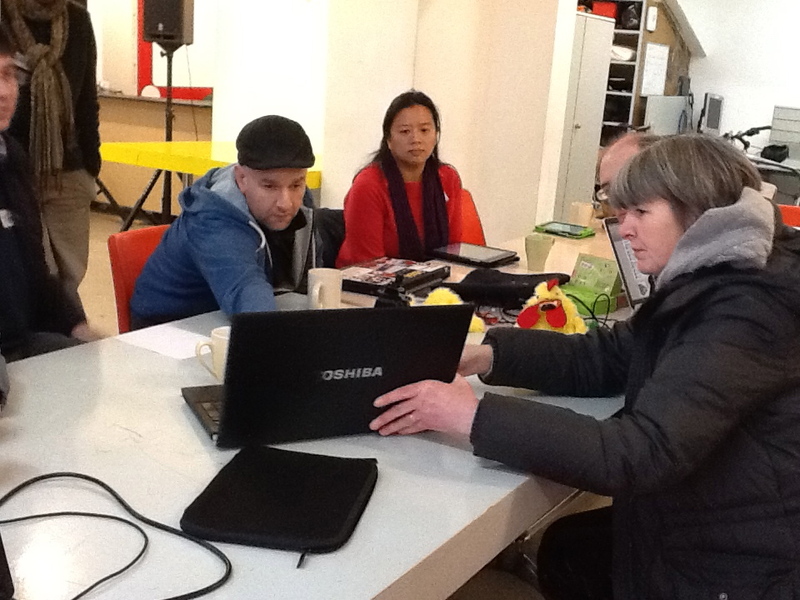 For example, Steven Flower – who kindly set up today’s meeting -organises U18 events at MadLab and is involved in Young Rewired State and CoderDojos. I’d love to encourage some of our CodeClub kids to come along to a big event like that. And my daughters too! We also loved this cheeky chap…. He’d hitched a ride with Dr Andrew Robinson from the University of Manchester who has been doing great work promoting fun projects using Raspberry Pi. His tweeting chicken even caught the attention of ITV news! He’s been writing worksheets to help children build these projects themselves and there’s a whole set of YouTube videos which are really fun to watch (Disclaimer- no hamsters were harmed during these demos, Andrew says He’s also taken these projects into schools. To be honest, it’s beyond my capabilities (unless I devoted a SERIOUS amount of time which I just haven’t got) but I’m really hoping my far cleverer fellow volunteers at Mellor would enjoy taking CodeClub in this sort of direction in future. The first step would be to encourage the children to attend events at MadLab where this kind of fun stuff is available to play with. The second step would be to arrange sessions to train volunteers how to do something simple with, say, the robotic chicken. They could then have the confidence to try it out with their own CodeClubs. DJ Adams did a great job noting down web resources for all the different stuff we discussed and he’s started a Delicious list with it all which should be a useful resource. Thanks, DJ! Maybe we’re being a little ambitious but that’s no bad thing. We’ve got a lot of catching up to do if we’re to create a new generation of computer programmers. And if we can’t do it in Manchester, then where else? 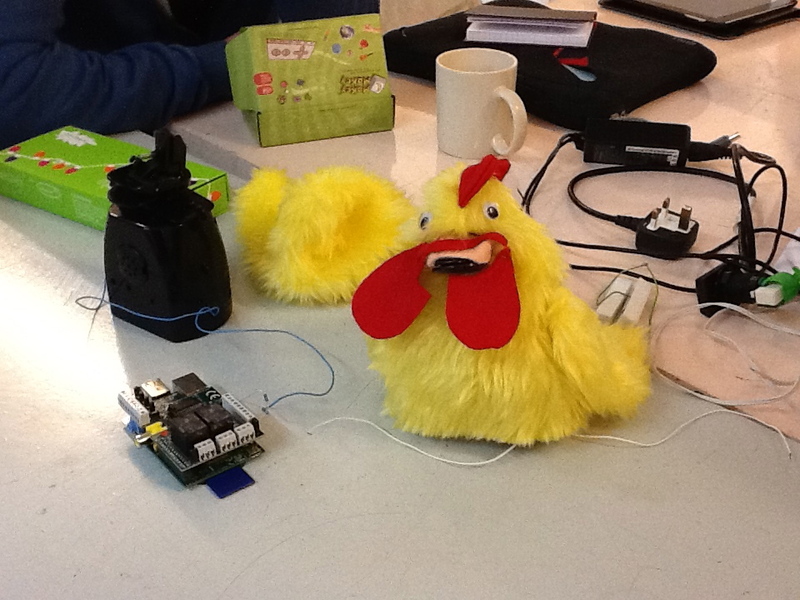 This entry was posted in Coding and tagged codeclub on January 13, 2013 by LizHannaford. Hello, Good to meet you and enjoyed reading the blog post. However, I don’t think it’s beyond yours or anyone else’s capabilities to get started in less than 1 minute (that was always our challenge)! I know people who have said a similar thing when they first saw Scratch! So, I’m laying down the challenge — once I’ve managed to look out how the other codeclub activities are written I’ll have ago at writing a guide for children to make a board game that interacts with Scratch. Like you say, nothing wrong with a bit of ambition, and if Manchester can’t make it work, where else can! Fair cop! I was being far too defeatist there It’s great that you’re able to put so much energy into doing this.